The fate of Ruslan Kulebayev, the best known “terrorist” in Kazakhstan at this time, will be known on November 2. Prosecutor Jarkyn Bakashbayev is asking to implement the capital punishment. Even though Kazakhstan does not apply the capital punishment due to an indefinite moratorium, charges of terrorism could lead to such a verdict even if the assassination of 10 individuals that Kulebayev is charged with is discounted. However, the debates around this case are sparked not necessarily by the prosecutor’s demands, but by qualifying Kulebayev as a terrorist. According to the investigators, the 26-year-old Ruslan was influenced by Islamic radicals in a prison where he was serving time for “typical” crimes: first for robbery and later for illegal possession of firearms. He was handed conditional conviction for robbery; but he was also apprehended for firearm possession, which resulted in a prison term just under three years. As the defendant told at the ongoing trial, the unjust conviction for the last crime he committed had forced him to get on the path of war with law-enforcement bodies. If one were to dismiss the discrepancies regarding the potential real number of those involved in that “bloody Monday” in July, then this single person’s actions fall far short of definition of terrorism. Another attack in June 2016 in Aktobe, Kazakhstan was also labeled terrorism after a group of young radicals attacked a weapons shop and then a military unit. In neither case did the attackers advance demands; casualties among civilians were perhaps non-premeditated victims. Any “abnormal” criminal act is considered an act of terror, i.e. instilling fear for political, religious or other purposes, in Kazakhstan. 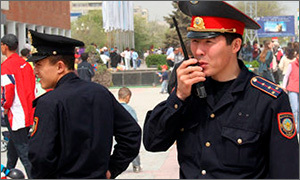 A case in point: following a tragic incident at the Arkankergen border guarding post—a situation that has never been completely explained, President Nursultan Nazarbayev declared, “I consider this a terrorist act.” Later, thanks to help by investigators, the “terrorist act” in question turned out to be a result of hazing that led to the shooting of 15 servicemen. Admittedly, President Nazarbayev may have known more than the public was told. Kazakh courts in other cities are trying a few more cases along with those of Kulekbayev and Aktoba radicals: trials are in Karaganda, Balkash and Shymkent. The first two groups are “religious” groups, while the latter is a “political” one, which is working at the orders of businessman Tokhtar Tuleshov, if one was to believe the investigators, who organised a strange coup d’état. “Airborne pirates” from Taldykurgan, Almaty Region, will soon be tried before judges as well. They are alleged to have attempted a 9/11 in Kazakhstan and wanted to hijack a small airplane in a provincial airport. All this happened over the last several months alone. The number of defendants, fortunately, does not correspondent to the number of incidents; Kazakhstan could be included into the same list with Pakistan and Somali if that were the case. Unfortunately, it would be inaccurate to say horrible events are not happening in Kazakhstan. They are taking place and some of them certainly shock the society. But in almost every single such case, save for the strange “Aksay massacre” in 2012, only law-enforcement and special services officers died at hands of these home-grown “warriors of jihad,” although some unfortunate passers-by did suffer as well. Independent journalist Sergey Duvanov has repeatedly attempted to emphasise the fact that said Kazakhstani “terrorists” would fit the description of classical terrorists only in the special services’ imagination. “Oh that tradition that we want to prove to everyone we are not worse than Europeans! ‘Look, we have our own terrorists too!’ Forgive my cynicism but this is the only way I can explain this joke the Astana mayor made,” Duvanov wrote in November 2015 after the akim of Astana made a statement that a group planning large-scale explosions in the capital was allegedly thwarted. Duvanov expressed doubt also in regards with the confirmed attack on power-wielding bodies in Aktobe earlier in the summer: “Unlike a bandit, a terrorist always has a task that is different from a banal robbery. It is now clear this act has had no specific goal. “The case of violence, which we saw in Aktobe, Almaty and Shymkent and are hastily calling ‘terrorism,’ are not terrorism in the strict sense of the term. This is a manifestation of extremism,” the journalist said while speaking to MPs and other participants of a roundtable discussion in Astana on September 22. Dosym Satpayev, a well-known political scientist, has a different opinion. In numerous publications and interviews, he repeatedly warns that real terrorism will soon rear its head in Kazakhstan. First, the authorities let the real “fifth column” slip in while they were busy fighting civilised political opponents; second, “for a long time, they [the authorities] would completely reject the very possibility of terrorist acts in the country, which they PR’ed in the whole world as ‘an island of stability.’ Then, after first terrorist acts, they tried convincing everyone it was more criminal than ideological, however perverted the latter might be,” Satpayev maintains. Journalist Duvanov has a supporter in the person of Yevgeniy Jovtis, a human rights advocate and director of the Kazakhstan International Bureau for Human Rights. According to Jovtis, “there are no clear-cut definitions of extremism, terrorism or separatism in international legal terminology. Since there is no [concrete] understanding, everything is left for power-wielding bodies’ discretion. “I do not consider the attacks on state bodies to be acts of terrorism. To my mind, they lack one of the defining qualities of a terrorist act—demands, goal. What was the goal here? Generally, the goal a terrorist act pursues is coercing the authorities into doing something or it eyes inciting panic, etc. In this particular case, perhaps the element of panic was observed. But when isolated, this component is rather dubious. The other issue is that [investigators] will need to look for an article in the Crime Code, which most appropriately describe Kulekbayev’s and others’ actions. So they chose the “terrorist act” article, since there is no exact definition of terrorism, which would be satisfactory from the legal viewpoint. “It was the most ‘comfortable’ one—it best reflected the domestic political circumstances at the time. And now, any attack on law-enforcement bodies or any other state officials will be considered as a politically motivated act. Even if no statements are made and no explicit terrorist goal is sought,” Yevgeniy Jovtis maintains, explaining his position. To be sure, there were panic and fear in Aktobe and Almaty; however, they were not caused by the attacks directly, rather due to lack of information and understanding among various arms of the government. All this influenced numerous rumours and contradictory information constantly updated in local mass media as well as press releases power-wielding bodies circulated. Frankly, this snafu gripped law-enforcement bodies during the actual attacks. And if one were to judge by the newly erected fences around police stations and directorates, which remind of fort walls, then the most scared ones are some of the final “beneficiaries” of said attacks, i.e. the police. In any case, both numerous thwarts of attacks as well as their fruition—targeting police and military—strengthen the government control over society. The “yellow level” of terrorist threat has already been introduced in the country starting in June all the way until January 15, 2017. The status quo allows blocking the Internet and mobile communications with no extra effort or permission as well as rejecting any application for protest rallies. They are now also planning to introduce amendments into the legislation while this extremism hype is still on. A portion of such novelties was presented to the parliament in September; human rights advocates and OSCE experts were critical of a number of them. These amendments not only further step up sanctions against those committing extremist and terrorist acts, but also entail additional “headache” for regular citizens. For instance, the government will be authorised to limit access to certain government services to those who rent their flats and houses but violated the norms of registering physical entities; new ways and reasons to deport undesirable foreigners; banning the import of unlicensed mobile devices that have encryption; and others. Implementing the majority of OSCE recommendations would be tantamount to death for a country that is used to controlling all and every aspect of its citizens’ lives. For instance, the OSCE spoke out in support of the rights of unregistered religious unions whom the authorities relentlessly fight; the organisation also insists on eliminating the term “leader of a public organisation” who are held responsible at a higher level of punishment for illegal acts; and demands the government to abstain from banning the import and use of mobile devices. Some of the recommendation could have been used to charge people, should they have been voiced by local rights advocates. “The existence or expression of opinions that are considered radical or extremist must not be considered a crime,” those at the OSCE maintain, all the while the Kazakh laws would consider a recommendation of this sort a justification for extremism. “The freedom to express opinions is applicable on all forms of expression of ideas, information or opinions, including those that are ‘insulting, shocking or outrageous’ for the government or a group of population”—just look at this seditious sentence! However, propaganda/public calls specifically are interpreted in a way that suits law-enforcement agencies and could serve as a magic wand for them; to date they have been incessantly using an article that enveloped a large field: “inciting national, social, religious” and other types of discords. Specifically, «We were able to put together a typical socio-psychological portrait of a radical. We know for sure an ordinary bandit or marginal is usually described with such characteristics,” Kazinform quotes the chief prosecutor as saying. In other words, the opinion the Prosecutor General’s office holds is close to the opinion of those who believe that “real” political and religious terrorism is non-existent in Kazakhstan at this time in spite of all the numerous court trials and clashes between fighters and police. The only thing everyone seems to agree upon is that Kazakhstan is no longer that “Island of stability” its authorities try to present it as abroad.